After I returned from the night shift this morning, I was trying to think of ways to keep myself up for a few more hours. A discussion with some friends at a recent party stirred some tentative interest in a corner of the geek world in which I rarely find happiness: Star Trek. So, I fired up the Wii Netflix and watched an episode of Star Trek: The Next Generation. I actually was a very intense Star Trek fan for about 5 minutes in my teens. I used to take a bus every Friday night to the Studio of Bridge & Games in Schenectady to play Dungeons & Dragons. Predictably, the topics of conversation at the studio covered all things Geek, but I hadn't watched much Star Trek so whenever the gabbing turned in that direction, I felt left out. So I set about finding the air times of any episodes of Star Trek and Star Trek: The Next Generation (I believe those were the only two out at the time). I educated myself quickly, was able to answer relatively not-too-obscure trivia (I could've told you the title of the episode in which the Romulans first appeared and that the actor playing the enemy Romulan captain was the same guy who played Spock's father, Sarek, but I couldn't have told you what Stardate it was or anything like that). When I left D & D and the studio behind, I left any desire for Star Trek with it. When I have happened to catch episodes of the various series, it was rare I felt anything but a yawn. In fact, when I did catch the occasionally impressive episode, it just made me feel more frustrated toward the series. I don't have much critical to say about the original Star Trek. It was a pioneering series and no one could deny it. Sure there was goofy, campy stuff and these days any jerk with a freeware program could drum up better special effects, but like it or hate it, the original series broke boundaries creatively and socially. Star Trek: The Next Generation though, and its companion spin-offs, pissed me off. They didn't piss me off because they didn't live up to the original. They pissed me off because they didn't live up to their own unlimited potential. There was so much that was good about the foundation upon which Star Trek: The Next Generation was built - and I'm talking about it as its own series now, not living in the shadow of the original - that it just made it that much more frustrating when the episodes were just as predictable and mediocre as your average situation comedy. But occasionally there were really wonderful episodes, and in most cases those episodes had something to do with time travel. Of the really memorable Star Trek: The Next Generation episodes I can remember, most if not all are time travel stories. There's the absolutely superb series finale "All Good Things..." which is truthfully one of the best series finales I've ever seen. There's "Yesterday's Enterprise," and then there are a bunch of episodes whose names I don't remember if I ever even knew them. I recall one where Q gave Picard the opportunity to relive his life after his artificial heart explodes. To be fair, I wonder sometimes how much of my ire for Star Trek comes from geek self-loathing. In my opinion, most if not all people heavily invested in any kind of culture that others term geeky choose some other part of the geek universe and passionately hate it in order to de-geek themselves just a little bit. Maybe that's what Star Trek has become for me. So...to the thing I have taken a very, very long way around to talking about (mainly because, as mentioned earlier, I am working the night shift this week and since I am slightly exhausted I can ramble quite a bit), I mentioned on twitter that I was watching "All Good Things..." this morning, got a response from Tim O'neil of The Hurting and a little while later Alan Doane chimed in, believing I'd given TNG short thrift. 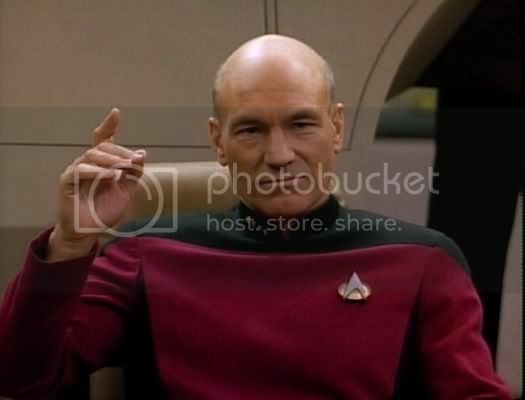 Soon, he posted a list of 21 great Star Trek: The Next Generation episodes. And since we have Netflix in my household, and since we have a Wii, and since every single episode of Star Trek: The Next Generation is available digitally on Netflix...well, I think it is my duty as geek pop culture blogger to watch all of these episodes ADD mentioned and blog about it. And if Tim ever posts his top 10 list, I'll have to look at those as well. So yes. That is going to happen. And now I'm going to sleep. While I sleep, and hopefully dream pleasantly, allow me to leave you with the stuff of nightmares. Deep Space Nine is much better than the Next Generation. It continued storylines on as well as had actual arcs. And maybe most important took chances, that the starship shows didn't/couldn't do. Events of previous episodes mattered and were referenced. Give it a fair chance and you'll see the writing and character exploration of a whole ensemble.